Listen to the MP3 here or here. It's http://mediahacker.org (not .com). I've published an interview with Jung Sik Hwa, a member of the Korean Metal Workers Union, and a video retrospective on the 77-day occupation there as well. Just listened to this, interesting overview - helped fill in some of the gaps as I'd missed a bunch of the details trying to follow the stuff through this forum, although the guy tips his hat to libcom's coverage which is cool. Update on arrests: as of today (August 11, 2009), 64 strikers have been arrested and even more are under investigation, some for violation of the national security law; the number of strikers being prosecuted is the highest ever for a labor dispute at a single workplace. The public prosecutors are reverting to earlier red-baiting tactics, reminiscent of the military dictatorships (1962-1987), as they are also trying to connect the Ssangyong factory occupation to ideological influences of a "third-party," claiming to have found posters opposing the U.S. military presence in Korea in addition to socialist literature. It appears to be classic demonization of working class militants as the implication, which is unsubstantiated, is that they were conspiring to otherthrow the government. Han Sang-kyun, the head of the Ssangyong Motors chapter of the Korean Metal Workers Union (KMWU), center, and other union members respond to a summons to appear in the Suwon District Court for questionning, Aug 10. Some 64 members of the Ssangyong Motors labor union have been arrested following their participation in the recent sit-in strike at the company’s Pyeongtaek factory, including all of the core union leaders and a number of workers. Prosecutors and police have even raised the specter of communism during the investigation, claiming, “Outside forces with a strongly pro-communist character were involved in the strike.” In response to this hardline response by prosecutors and police, labor is warning that another strike similar to the one at Ssangyong’s Pyeongtaek factory could result from the administration’s public security witch-hunt that destroys the spirit of labor-management consensus. Judges Jeong U-yeong and Jeong Ha-jeong of the Pyeongtaek branch of Suwon District Court issued arrest warrants Tuesday morning for 38 of the 42 workers for whom warrants were requested for violating the Law on Punishment of Violent Acts, obstructing the performance of official duties, and obstructing operations. The two judges cited sufficient grounds for criminal charges and flight risk as reasons for issuing the warrants for the workers, including one for Han Sang-kyun, the head of the Ssangyong Motors chapter of the Korean Metal Workers Union (KMWU). Han and the other workers are also being investigated for acts of violence against police officers and the company’s security personnel during the occupation of the factory from May 21 to August 6, and for using illegal weapons such as Molotov cocktails and air rifles. These arrests, together with the 26 workers that had previously been detained, bring the total number of detainees in connection with the Ssangyong Motors strike up to 64. 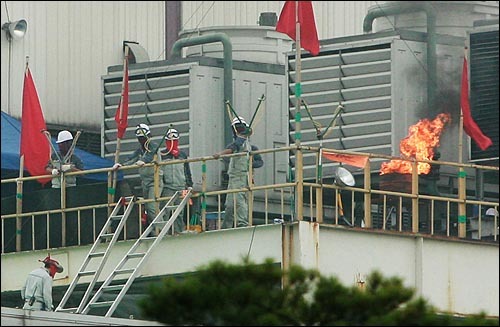 This is the largest number of detentions since police brought in 58 union members following the Posco union’s sit-in at the Posco headquarters in Pohang in May 2006. It also appears likely to mark the biggest public security incident in 12 years, if the 1997 arrest of 195 individuals at the inauguration of the South Korean Federation of University Student Councils (Hanchongryun) is included. Police announced that they had received warrants Tuesday for the arrest of two additional individuals connected with the union, and that they had requested that a total of 68 people report in, of which 12 are individuals who are unaffiliated with the union. As of Sunday, prosecutors have also announced that “outside forces with a strongly pro-communist character” were involved in the Ssangyong Motors strike, including individuals with a prior history of violating the National Security Law. “We confiscated ideological documents and illegal weaponry, and uncovered an attempt to establish a military committee,” prosecutors reported. However, the security investigation division of the Gyeonggi Provincial Police Agency, which actually conducted the investigation of the case, was unable to apply charges of violating the National Security Law against any of the individuals. This suggests that baseless charges of communist sympathies have been pinned on workers who waged a strike against large-scale layoffs. Observers are also commenting on the fact that prosecutors and police have been focusing on the actions of the union while ignoring the illegal and violent acts perpetrated by the company and the police. There has been no mention of an apology from police, let alone criminal punishment, for the indiscriminate assaults on fallen union members during their August 6 entry into the factory. Moreover, although company employees were booked without detention, none have been arrested for attacking members of civic groups with pieces of wood in front of the factory‘s main gate on August 5 and 6. Police are also doing nothing about the fact that the company violated the Fire Services Act by cutting off electricity and water for fire hydrants, violated the Emergency Medical Service Act by preventing medical personnel from entering or exiting the occupied factory, and violated basic human rights by blocking individuals from bringing the workers water and food. “If the administration goes against the people’s desire for mutual benefits of labor and management, a fierce struggle is inevitable,” the union claimed. That articles good - and clearly shows up the hypocrisy of the "law" in punishing striking workers for violent acts, but far from punishing, actually encouraging the violent acts of the scabs. Any idea what public opinion in South Korea is like on this? I interviewed Jung Sik Hwa, a member of the KMWU. He cited a public opinion poll saying 60% of Koreans wanted the occupation ended through a settlement in a non-violent way, not through police assault.